MIAMI GARDENS, FL – Arlington Academy hosted its Fourth Annual Health Fair on Jan. 9, 2016 on their campus at 4814 N.W. 167 St., in Miami Gardens, Fla. The event boasted HIV & Syphilis testing, dental hygiene presentations, blood donations, girl mentorship program information, and a bounce house for the kids. Volunteer services were provided by Miami Dade County Public Schools’ 5000 Role Models of Excellence. Students were accompanied by their director, Paul Wilson. The high energy music was provided by DJ Ivory and Papa Keith of 103.5 The Beat radio. “I am blessed to be here with you this morning,” said radio personality, Papa Keith, as he welcomed guest to the health fair. 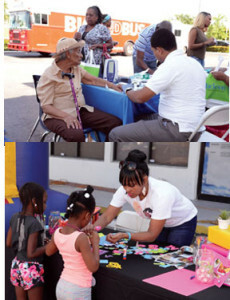 “These health fairs bring awareness and allow people who probably think they can’t afford health care to get a check-up for free. Miami Gardens’ Chief of Po-lice Antonio Brooklen reiterated the City’s commitment to healthy living. Other Health Fair supporters and sponsors included Molina Healthcare, Union Positiva, Jackson Health Systems, Miami Dade College, Higher Learning Entertainment, Publix, 103.5FM The Beat, Oh So Sweet, Ballroom Events, and Freez Frame Marketing & Media. Arlington Academy of Miami is committed to providing outstanding elementary, middle, and high school (college preparatory) education. The Academy distinguishes itself through the excellence of its instruction and by providing a challenging, but supportive environment for its students. Our objective is to maximize the potential of each student and foster values of autonomy, responsibilities and academic excellence.